Ability Magician: The Pokémon steals the held item of a Pokémon it hits with a move. "I wouldn't do that if I were you...NO REALLY I WOULDN'T EVEN DARE." "Hoopa Confined is a light purple Pokémon with several pink markings. There is a v-shaped marking on its chest and bands around its wrists. Additionally, there are pink markings around its head and a growth on top resembling hair tied into a ponytail. There is a yellow, ring-shaped marking in the center of its forehead, and it has green eyes with yellow sclera. On either side of its head is a dark gray horn that curves slightly upward. Hoopa has three gold rings: one large one around its lower body and one hanging freely on each of its horns. Its arms are not attached to its body and float next to it. Each arm has a small golden spike on one end and a hand similar to a mitten on the other. There is a golden spike on each shoulder, which is similar to those on its arms. Hoopa's lower body consists only of a wispy structure similar to its ponytail. Hoopa Unbound has a similar color scheme to Hoopa Confined, although the main color is now a light blue and its markings are slightly darker. This form is bipedal and has six arms. The ponytail on its head is larger and bushier, and its eyes are now yellow with white sclera. Its horns are darker and less curved with spiky, purple fur at their bases. This form has a pointed, dark gray snout and a mouth full of pointed teeth. Several tufts of purple fur surround its torso. Each of its arms is disconnected from the body and has a gold ring on one end and a three-fingered hand on the other. It has a ring around each wrist as well. Many other rings are present on this form: there are two around each ankle, two around the base of its ponytail, two at the base of each horn, one near the center of each horn, one around its waist, and one encircles a black hole in the middle of its body. The circular mark on its forehead also surrounds a much smaller black hole. A purple, protruding stripe extends down each leg, widens at the knee, and makes a circle around the tip of the foot. Additionally, this form has a tail with a purple stripe along the top and an arrow-shaped tip." Appearance Usually seeming small and cute, this little mischief maker has a big secret. Carrying their own prison bottle as a necklace, Hoopa can change between forms whenever they desire. Allowing them to become giant in the blink of an eye. 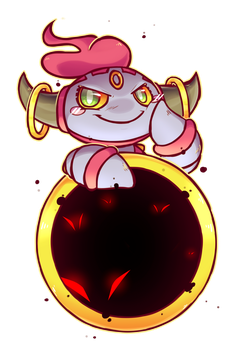 When unbound, small scars barely noticeable on the small body of Hoopa become more pronounced. From the many battles they have endured. Religion This is a joke right? Motivation Hoopa is just here to have fun, but since the Outbreak occurred, having fun has gotten more difficult.